Explore the data on this year's choices. 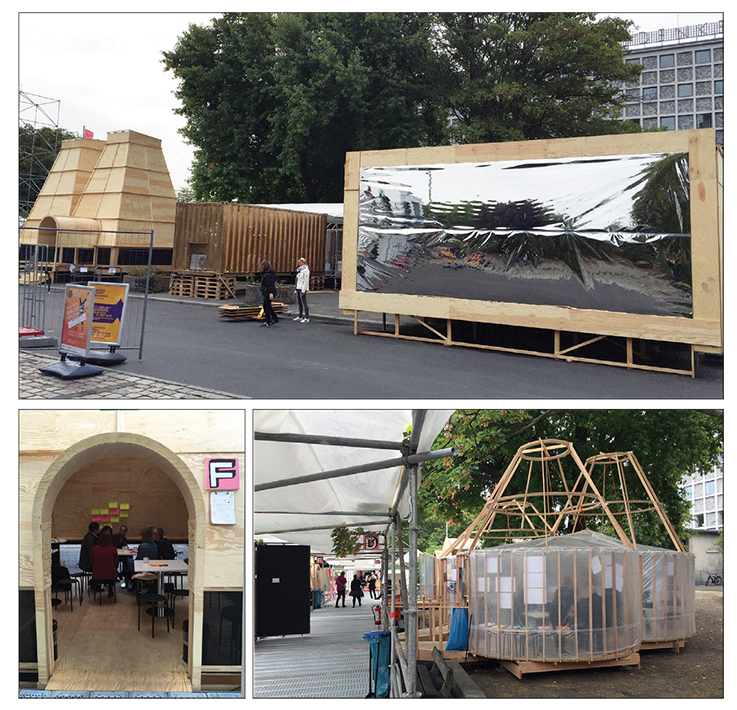 LJ's Years in Architecture compared: FY13–18 Cost Summaries and Funding Sources. I expected to be surprised, excited, and inspired by what I would encounter at Next Library’s satellite conference in Berlin this past September, and it did not disappoint. 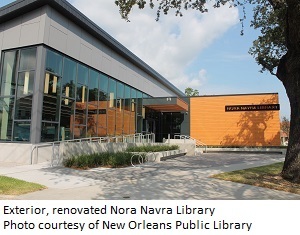 New Orleans Public Library’s (NOPL) Nora Navra Library celebrated its grand reopening in the city’s 7th Ward neighborhood on Friday, August 24 and Saturday, August 25. The completion of the new 7,800 square foot building marks the reopening of all six NOPL branches that were destroyed in the flooding caused by Hurricane Katrina in 2005. Mini design charettes offered attendees of LJ's Design Institute: Salt Lake City the opportunity to brainstorm solutions to the real world challenges of their library peers. 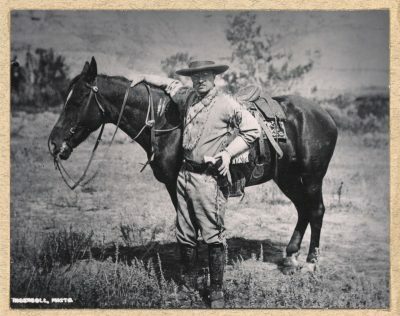 The Theodore Roosevelt Presidential Library and Museum Foundation has abandoned a proposal that would have split the museum and library between Theodore Roosevelt National Park and Dickinson State University. Harris County, TX, reopens two branches damaged in Hurricane Harvey; the ideaX Makerspace launches in Bellevue, WA; Gannon University’s Nash Library & Student Learning Commons, Erie, PA, reopens; and more new construction and renovation news from the June 1, 2018 issue of Library Journal. Rolf Hapel, Director of Citizens’ Services and Libraries in Aarhus, Denmark since 2006, will be stepping into the role of Distinguished Professor of Practice in Residence at the University of Washington Information School (UW iSchool), Seattle. Update: A local citizens' group, Keep a Library in Watchung, has filed a lawsuit in Somerset County Superior Court against the Borough Council, seeking to overturn its decision to close the library. 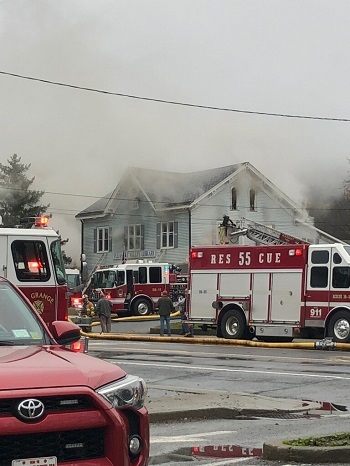 The suit alleges that the council's actions violate the New Jersey State Constitution of 1947 as well as the U.S. Constitution, the Open Public Meetings Act, the New Jersey Civil Rights Act, and New Jersey’s Local Housing and Redevelopment Act. The planned Barack Obama Presidential Center will not contain a traditional presidential library of physical archives from Obama’s two terms as president, but it will hold a branch of the Chicago Public Library to serve the Jackson Park neighborhood of Chicago’s South Side. The six projects that won the 2018 AIA/ALA Building Awards are worth a good look. The awards, presented each year by the American Institute of Architects (AIA) and the American Library Association (ALA), celebrate excellence in architectural design and help identify trends to consider in new buildings or renovations. 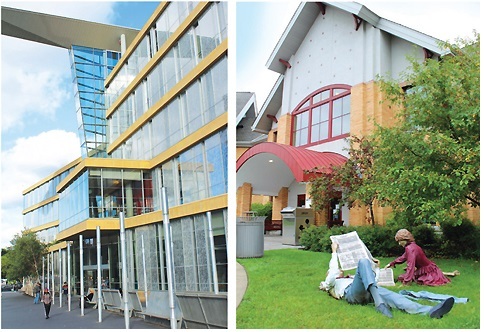 The key notes of the Laurel Branch Library—transparency and playfulness—work together. NYLA’s benchmarking system helps libraries, step by step, attain organizationwide sustainability. The American Institute of Architects (AIA) partners each year with the American Library Association (ALA)/Library Leadership and Management Association (LLAMA) to recognize the best in library architecture and design. The 2018 AIA/ALA Library Building Awards, announced on April 6, included public libraries from Cape Cod to California. Kenyon College receives $175 million; La Porte County Public Library, IN, wins an AIA merit award; Rockford Public Library, IL, will get a new building; and more new construction and renovation news from the February 1, 2018 issue of Library Journal. The National Endowment for the Humanities (NEH) recently announced a new program to create and sustain the infrastructure underlying humanities initiatives in public libraries, archives, museums, colleges and universities, historic sites, scholarly associations, and other cultural institutions. Openings abound: new Archives and Research Center (ARC) addition Texas State University, San Marcos's STAR Park; revamped Schomburg Center for Research in Black Culture in NY; renovated Shippensburg Public Library, PA; and more new construction and renovation news from the December 2017 issue of Library Journal. Librarians from around the country convened on October 20 in Washington State, at Fort Vancouver Regional Library’s Vancouver Community Library for an exploration of community engagement, sustainable design, and adapting to changing needs. The building, a 2015 LJ New Landmark Library, serves as gathering place and convener for the midsize city and exemplified the day’s themes from start to finish. Update: At an emergency meeting on Wednesday, December 20, the Public Library of Cincinnati and Hamilton County (PLCHC) board voted 5–0 (two members were not in attendance) not to sell the North Building. 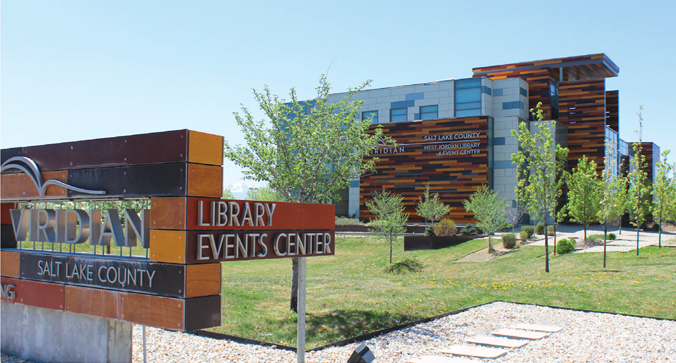 Instead, the library will seek a 1 mill tax levy in May, 2018 to help supplement its $54 million facilities plan. The library will host a community conversation on December 27. Colorful, vibrant new spaces at the Indian Trails Public Library District, Wheeling, IL; “Discovery Island,” at the Laurel Library, Prince George’s County Memorial Library System, MD; and the renovated children's room at the Central Branch of the Cranston Public Library, RI. Renovations reveal the library's personality, from the renovated children’s area at the Oak Bend Branch of the St. Louis County Library to double bands of windows at the Baldwin Public Library, Birmingham, MI, to the historic wing of the Lithgow Public Library, Augusta, ME, and more. Built to anchor their communities: the Seguin Public Library, TX; Elmhurst Community Library, Queens Library, NY; the new Joplin Public Library, MO; and the Grove City Library, Southwest Public Libraries, OH. Innovative learning spaces at the Cabot Science Library at the Pritzker Commons, Harvard University Science Center; Library of Engineering and Science, Wilmeth Active Learning Center, Purdue University; Vaughan Civic Centre Resource Library, Ont. Common spaces remade at the Cozby Library and Community Commons, Coppell, TX; the Patricia R. Guerrieri Academic Commons, Salisbury University, MD; and The new Havre de Grace Branch of the Harford County Public Library, MD. Library makeovers feature the Sorrells Engineering and Science Library at Carnegie Mellon University, Pittsburgh; the two-story Heaton Family Learning Commons, Butler County Community College, PA; and the colorful the new Alfred R. Goldstein Library, Ringling College of Art & Design, Sarasota, FL. Come for the books, stay for the views at the Multnomah County Library’s Rockwood Library Makerspace; Boston Public Library's Jamaica Plain Branch; the Shoreview Library, Ramsey County Library, MN; and the Imperial Beach Library, CA. The data for academic new buildings and renovations featured in LJ's Year in Architecture 2017. The architects and designers behind this year's libraries. As demonstrated in this year’s 82 building projects, completed between July 1, 2016, and June 30, 2017, academic and public institutions are now regarded as places of community, of gathering, and of collaboration, even as reading remains in play. From Long Beach's Michelle Obama Neighborhood Library to Harvard University’s Cabot Science Library, LJ explores some of the top trends in library architecture this year. Model remodels at the Colchester–East Hants Public Library, Truro, NS; the Library! at Bown Crossing, Boise, ID; and the Columbus Metropolitan Library's Northern Lights Branch. At a November 15 board of trustees meeting, New York Public Library (NYPL) administration unveiled the master plan for renovations to its main branch, the Steven A. Schwarzman Building on Fifth Avenue and 42nd Street in Manhattan. The work is part of NYPL’s Midtown Campus renovation, which includes the gut renovation of the Mid-Manhattan Library across Fifth Avenue, currently in progress. Prince George’s County Memorial Library System, MD, welcomes renovated Bowie Branch; ten Kentucky libraries awarded $20 million in construction funds; Chicago's Newberry Library to get an $11 million renovation; and more new construction and renovation news from the August 1, 2017 issue of Library Journal. The New York Library Association (NYLA) is poised to make library history with the launch of its Sustainable Libraries Certification program this November. The New York Public Library is having a moment—a very good one. September saw the debut of Ex Libris: The New York Public Library, a long-anticipated documentary by renowned director Frederick Wiseman that is sure to expand the appreciation of the impact of this great institution and libraries as a whole. As if that weren’t enough, there was also the announcement of a gift of $55 million from the Stavros Niarchos Foundation to help bring the radically reenvisioned Mid-Manhattan Library into being. The New York Public Library (NYPL) announced September 13 the receipt of $55 million from the Stavros Niarchos Foundation to support the complete renovation of the Mid-Manhattan Library, NYPL’s largest circulating branch. Combined with the recent boost in funding for FY18 capital projects from the city of New York, the Niarchos Foundation’s gift will enable the $200 million gut renovation of the 105-year-old building into a modern circulating branch that will offer programs for children, teens, and adults; meeting spaces; a business library; and a rooftop terrace, designed by the Dutch architecture firm Mecanoo in coordination with architects of record Beyer Blinder Belle. In many types of libraries nationwide, staff are trying to make more space for people. Increasingly, libraries support learning that is social and emotional as well as intellectual, carving out room for learning commons, flexible spaces, quiet contemplation, and active collaboration. 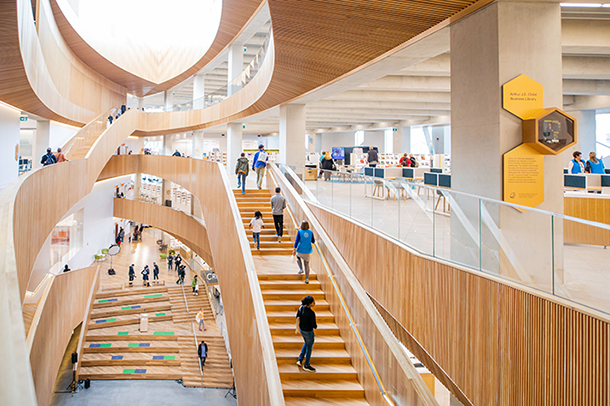 Quality 21st-century library design focuses on human health and well-being. Creating healthy indoor environments that physically connect us to the outdoors, offer access to daylight and views, and motivate us to move our bodies more is critical, since, according to the Environmental Protection Agency, on average, Americans spend 93 percent of their lives indoors. The focus on prioritizing daylight and views and incorporating biophilic tenets (which acknowledge the role of nature in human comfort and productivity) has increased awareness about the critical role the building plays in wellness. LJ recently caught up with Carl Grant, associate dean of knowledge services and chief technology officer for the University of Oklahoma (OU) Libraries, to discuss a few of the ways the library is helping faculty incorporate virtual reality and other emerging technologies into research and coursework, as well as recent remodeling projects, and how high tech and new collaborative spaces both play key roles in OU’s effort to make the library the “intellectual crossroads” of the university. A soaring atrium can offer delight and inspiration. However, atria can also present a platform from which people can do themselves harm. Individuals looking for publicly accessible spaces to conduct self-inflicted violence have sought out libraries, including atria in the San Francisco Public Library’s main branch and the San José State University’s (SJSU) joint public-academic library. On the East Coast, libraries at New York University (NYU) and Brown University have experienced similar tragedies within the past decade. The best libraries don’t stop at the front door. Gardens and green roofs alike are beautiful and inspiring. The benefits of exposure to nature are much more than cosmetic: for individuals, research has related it to reduced stress, inflammation, and mortality; improved memory, job satisfaction, and eyesight; and greater social capital. For communities, successful public outdoor spaces not only improve the physical and mental health of residents, they have been shown to aid the environment, create a stronger sense of community, and even boost the economy. The people of Texas and Louisiana are beginning to rebuild after Harvey, and the library community has stepped up to help. 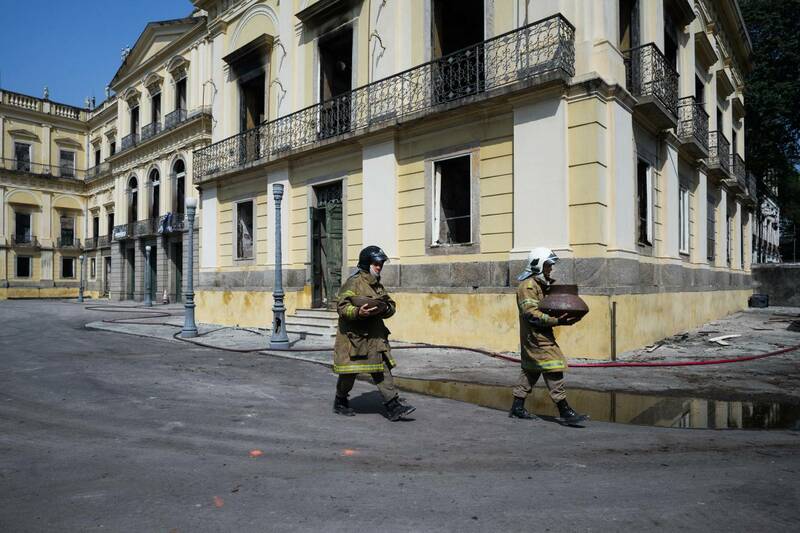 As we have seen in the aftermath of all too many disasters, the library infrastructure and network is critical. Not only do libraries provide refuge and expertise to put to work on relief efforts, but librarians consistently offer compassion and are ready to serve anyone in need. Over a five-day period, Hurricane Harvey devastated the Gulf Coast area of southeastern Texas and parts of Louisiana. More than 50 inches of rain fell, killing at least 66 people, displacing 30,000 others, and causing up to $190 billion in damages. When skies finally cleared at the end of August, libraries' cleanup efforts began in earnest. Measure the Future, an open source, open hardware project that enables libraries to collect and analyze data regarding how their physical space is being used, will soon deploy new sensors at libraries participating in its public beta launch, including the Meridian Library District (MLD), ID; the State University of New York, Potsdam; the New York Public Library; the University of Boston Law Library; and the Carnegie Library of Pittsburgh. Ohio’s Columbus Metropolitan Library hosted a deep dive into design in a setting that spoke volumes. 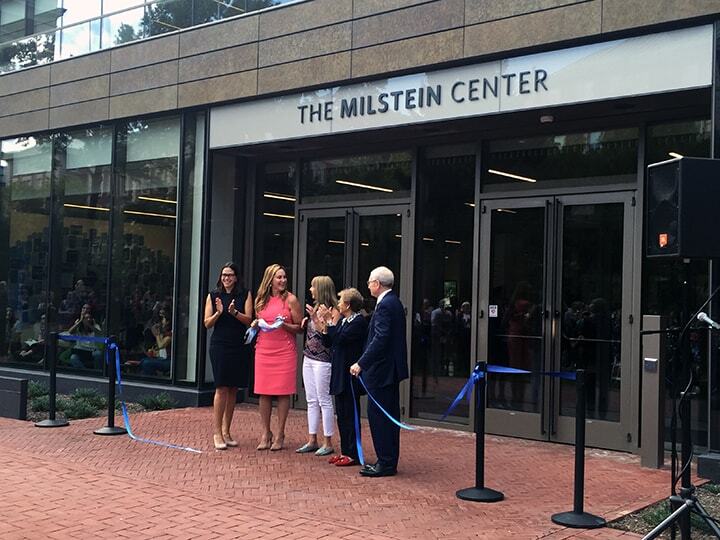 The renovated Glendale Central Library, CA, reopens; Boston Public Library's Jamaica Plain Branch is back in business; and more new construction and renovation news from the June 15, 2017 issue of Library Journal. In the wake of the president’s announcement that the United States will withdraw from the Paris Agreement, an unprecedented, decentralized groundswell of support to combat climate change in our country has emerged. The Indian Trails Public Library District, Wheeling, IL, reopens, ; Gladwyne Free Library, PA, wraps up a renovation; the Sandhills Branch of the Richland Library, Columbia, SC, continues a multimillion, multibranch building effort; and more new construction and renovation news from the May 15, 2017 issue of Library Journal. Furnishings of note from recent library projects. Sometimes, just envisioning something can set change in motion. That’s what’s happening at the Belgrade Community Library in Montana. That little library was named LJ’s Best Small Library in America in 2015 and effectively leveraged the honor for local interest and investment. A few years later, the library, under the leadership of Director Gale Bacon, continues to make the most of its opportunities, now via design that is helping to set the community’s sights on a possible future. Montana’s Belgrade Community Library is perhaps best known to LJ readers as the 2015 Best Small Library in America. After receiving the award, Director Gale Bacon tells LJ, many in the community started asking what the library’s next step was. The 9,700 square foot building presented the six-person staff with “huge physical space challenges,” Bacon says—not only limiting the size of the collection and staff work space but having routinely to turn would-be attendees away from programs. So achieving this milestone seemed like the right time for reexamination. By the time it opens in 2018, the Calgary Public Library’s (CPL) new Central Library will have been 14 years in the making. In 2004, the City of Calgary, Alta., first allocated funding to study its residents’ future library needs. Since then it has committed a whopping $175 million (in Canadian dollars, or $128 million U.S.) to the project, out of a total estimated cost of $245 million (about $180 million U.S.). East Baton Rouge Parish Library, LA, reopens its Greenwell Springs Branch after flooding; Chicago Public Library to partner on three new branches collocated with housing; and more new construction and renovation news from the April15, 2017 issue of Library Journal. After the impact of the recession, Arizona State University (ASU) bounced back with an ambitious agenda of innovation, positioning itself as the “New American University.” ASU prides itself instead on being “measured not by whom it excludes but by whom it includes and how they succeed,” and now ASU's flagship library is reinventing itself to serve the whole student. The 2017 AIA/ALA Library Building Awards recognize eight outstanding new libraries and renovations. Libraries are a key element in community ecosystems. Now imagine a library that actually is an environmental ecosystem of its own. The furthest reaching green building certification uses the metaphor of the flower—thriving within a given habitat by pulling nutrients from the soil, using sunlight for photosynthesis, and depending on the sky for rain—to describe the requirements for its green building program. Each element of the certification is called a petal, and each represents a major part of the eco­system: energy, water, and materials. The International ­Living Future Institute administers the Living Building Challenge. Overnight we went from a president who declared climate change as the single greatest threat to future generations to a president, and Senate, who appointed a climate change denier to head the U.S. Environmental Protection Agency (EPA). Dayton Metro Library opens its Miamisburg Branch, the new Pinewoods Library and Learning Center launches in Athens, GA, and more new construction and renovation news from the March 15, 2017 issue of Library Journal. In recent years, the University of Massachusetts, Amherst (UMass), has committed to economic, environmental, and social sustainability. The robust leadership skills and networking know-how of sustainability studies librarian Madeleine Charney have contributed immensely to that effort. Michelle Obama Neighborhood Library opens in Long Beach, CA; Tufts Central Library, Weymouth, MA, gets OK on new facility; Cook Memorial Public Library District, Vernon Hills, IL, to expand; and more new construction and renovation news from the February 15, 2017 issue of Library Journal. The sustainability of our world depends on a strong social fabric in local communities where people know and respect one another. This social fabric is key for resilient communities in the face of environmental, economic, and social disruption. That fabric is now torn in many places thanks to the vitriol and viciousness of the presidential election and fears about what will happen next. 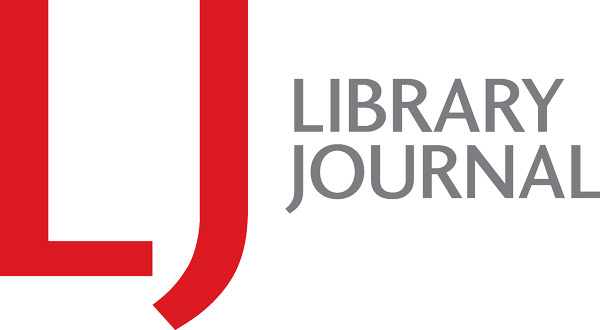 Albany Public Library, NY, Board of Trustees refinanced $29.1 million in bonds to improve five branches; the Ashtabula County District Library, OH, reopened; Clark Art Institute's Manton Research Center, Williamstown, MA, was completed; and more new construction and renovation news from the January 1, 2017 issue of Library Journal. 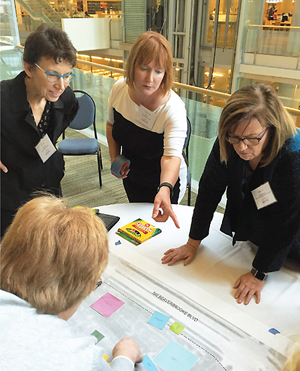 At LJ’s Design Institute (DI): Charleston, held on Friday, October 21, at South Carolina’s Charleston County Public Library, attendees from around the United States delved into how best to transform their libraries to rise to their communities’ new challenges. Starting in 2017, 15 small and rural public libraries from across the United States will participate in the Small Libraries Create Smart Spaces project, an 18-month training program aimed at reimagining and reconfiguring libraries to support active learning, foster social connections, and be places of continued discovery. 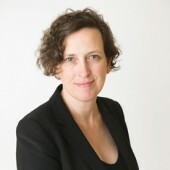 The project will lead participating libraries through four stages of training, help them to develop an online cohort, and connect their work to the profession at large. Led by a project team of WebJunction, a program of OCLC Research, the project is funded by a National Leadership Grant from the Institute of Museum and Library Services (IMLS) in partnership with the Association for Rural and Small Libraries (ARSL). 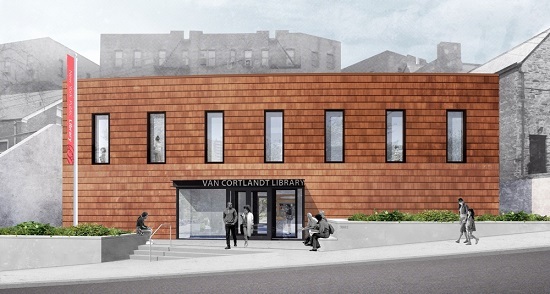 Participating libraries will receive $5,000 toward their space redesigns. Resilience: to bounce back after disruption. We've dealt with a lot of disruption as libraries and citizens in the past year. From a pretty insane presidential race to a major nationwide Internet outage caused by a distributed denial-of-service (DDoS) attack that harnessed the Internet of Things to hurricanes, drought, and forest fires, we've got disruption in just about every sector of modern life. On October 14 architect Maya Lin unveiled her plans for the new William Allan Neilson Library at Smith College, Northampton, MA. The drawings and model for the extensive renovation of the library, which will include upgrades and alterations to the original building and the replacement of two previous additions, were met with approval by the gathering of students, faculty, and administration at Smith’s Sweeney Concert Hall—not surprising, as they were only part of a years-long visioning process that involved thousands of the college’s community members from campus to town. Central Arkansas Library System's Dee Brown Library relaunches; Tulsa City-County Central Library's three-year remodel is open; Dayton Metro Library gets a new Vandalia Branch; and more new construction and renovation news from the November 15, 2016 issue of Library Journal. This year’s selection of library construction efforts are each unique in their own way, but most share a significant guiding principle: keep it open. The 105 capital projects completed between July 1, 2015, and June 30, 2016, exemplify a dedication to the totality of users’ experience with regard to sight lines, maneuverability, accessibility, and natural light but also in consideration of others’ ideas, needs, and potential. With atria, lots of glass, and coworking and group study spaces, libraries are indeed open for business. Featured: the Hewitt Public Library, TX; Dayton Metro Library Operations Center; and Oregon Branch Library, Toledo-Lucas County Public Library. Featuring the Longwood Public Library, Middle Island, NY; Lewes Public Library, DE; Milton Library, Atlanta-Fulton Public Library System; Libbie Mill Library, Henrico County Public Library, VA; and Northeast Regional Library, Raleigh, NC. Featuring the Poway Library, San Diego County Library; San José Public Library’s Village Square Branch, CA; Jamestown Bluffs Library, St. Louis County Library, Florissant, MO; Winfield Library, KS; and Canfield Branch Library, Public Library of Youngstown and Mahoning County, OH. Featuring the Boulder Public Library, CO; Brooklyn Park Library, MN; Marmalade Branch, Salt Lake City Public Library; Fretz Park Branch, Dallas Public Library; Kaysville Branch Library, UT; Eastside Branch of Kentucky’s Lexington Public Library. Featuring the Alpine Branch of the San Diego County Library and the Carnegie Library of Pittsburgh–Knoxville. Featuring Brown University’s Sidney E. Frank Digital Studio at the Rockefeller Library; the Bibliothèque Desjardins, Université du Québec à Trois-Rivières, Drummondville; the James Branch Cabell Library, Virginia Commonwealth University; and the Information Commons at the University of South Florida Sarasota-Manatee. Featuring the Digital Scholarship Laboratory, Evans Library, Florida Institute of Technology, Melbourne and the Mendel Gottesman Library, Yeshiva University, New York. The Year in Architecture's architect listing. For the Year in Architecture 2016, Library Journal solicited information from academic libraries nationwide that had undergone new builds and renovation/addition projects completed between July 1, 2015, and June 30, 2016. The tables below comprise complete financial and construction statistics for the 13 academic library buildings submitted. For the Year in Architecture 2016, Library Journal solicited information from public libraries nationwide that had undergone new builds and renovation/addition projects completed between July 1, 2015, and June 30, 2016. The tables here comprise complete financial and construction statistics for the 92 public library buildings submitted, including Canadian projects. It’s time to ignite a movement in libraries, one that faces head-on the pressing threat brought by climate change and addresses every way we can help to secure a better future, or, in more stark terms, a future for the generations to follow. This seems more imperative every day, but the functional response is limited. East Waco Library, TX, reopens; Jersey City Free Public Library, NJ, is back after a renovation; Columbus Metropolitan Library, OH, has revamped and expanded its Northern Lights library; and more new construction and renovation news from the October 15, 2016 issue of Library Journal.